Kenny Jackett revealed Aston Villa recalled Andre Green to meet the domestic home-grown player quota. And the Pompey boss admits it was news that caught him by surprise. 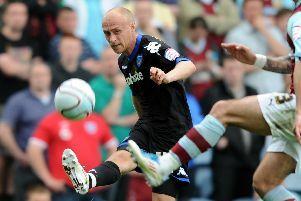 Green has returned to Villa Park after spending the first half of the season on loan at Fratton Park. The England under-20 international scored five goals in 12 appearances – including late winners in the FA Cup at Rochdale and Norwich. Villa boss Dean Smith contacted Jackett yesterday, however, to inform the Pompey boss he wanted Green back in the midlands. And it’s because the Championship outfit have to meet domestic quota in their set-up. The Blues boss said: ‘I got the call yesterday from Dean Smith, the Aston Villa manager, saying he was likely to recall Andre during the course of the day. ‘Having enough home-grown talent and quota in their group is something they’ve been looking at. ‘We’re thankful to Aston Villa for the loan. ‘It was out of the blue, definitely, and not something we engineered but we obviously know what the loan market is and how it is. ‘We wish Andre all the best. He scored some vitals goals for us and it’ll be interesting to follow his development now. ‘It was more to do with the home-grown player rule they have internally and having enough players in their squad that fulfils that criteria. Green is the third loanee to return to their parent club during the January transfer window after Joe Mason (Wolves) and Ben Thompson (Millwall).